Sikar, situated in Shekhawati region of Rajasthan, has a glorious history of peasant struggles. From 1920s through 1960s, peasants of Sikar fought successfully against the jagirdars. Sikar had an extremely oppressive jagirdari regime under the Raja of Sikar and peasants worked under a huge burden of taxes (lag) and obligation to provide unpaid labour and military services (bag). It was on account of peasant struggles that started in the early 1920s and culminated with abolition of the Jagirdari system in the 1950s that sharecroppers in Sikar got ownership (khatedari) rights over land. From the 1960s through the 1980s, the struggles for progressive change in rural Rajasthan were fought on three main fronts. In Udaipur and Dungarpur, adivasis organised under the red flag to take forward the struggles of adivasis for land rights and against oppression by the feudal landlords, traders, local officials and police. In the North-western region of Rajasthan, where Indira Gandhi Canal was being constructed, the Kisan Sabha led the struggle for allotment of land to landless households. In Sikar, the focus of struggles was on education, as students from peasant households fought to have access to schools and colleges. Student Federation of India provided leadership to these struggles in Sikar. Students from peasant households, which had been liberated from the shackles of the jagirdari system, joined the Student Federation of India and struggled for better facilities for education. Given the predominantly agrarian character of the society in Sikar, struggles by the Kisan Sabha and the Student Federation for India were always directly related and strengthened each other. It is of note that, with an annual rainfall of just about 600 mm, high summer temperatures and sandy soils, agriculture in Shekhawati region suffers from severe water scarcity. Frequent droughts are a major cause of continued economic distress in the region. Since the 1970s, large numbers of skilled workers – mechanics, drivers, plumbers and masons – from villages and towns of Shekhawati started migrating to the gulf region and to other parts of India. Remittances received from migrant workers have been an important source of income for rural households and facilitated investments in tubewell irrigation and mechanisation of agriculture. Although expansion of tubewell irrigation facilitated significant agricultural growth in the region, agricultural yields remain highly sensitive to vagaries of the weather. Growth of agricultural production in the region has been led by an increase in yields of wheat and rapeseed. Rajasthan is the largest producer of rapeseed in India. Shekhawati region was at the forefront of growth of oilseed production in India since mid-1980s. Wheat, rapeseed and onion are the major crops of rabi season in Shekhawati. With high temperatures and low rainfall, agricultural production in the kharif season is dominated by unirrigated pearl millet. Incomes from crop production are mainly in the rabi season when wheat, rapeseed and onion are sown on land that has access to groundwater irrigation. Rearing buffaloes, camels and goats is also an important occupation of rural households in the region. Landscape of Shekhawati region is dotted with khejri (Prosopis cineraria) trees, which can survive in the worst of the droughts and are an important source of fodder for camel and goats. Buffaloes are mainly fed wheat and pearl millet straw. With frequent droughts, selling these animals during drought years is an important drought-proofing strategy for rural households. In particular, large numbers of cows and buffaloes are sold during drought years because of lack of availability of fodder. Over the last 25 years, successive Congress and BJP governments in Rajasthan have taken the lead to implement the neo-liberal economic policies. Withdrawal of public support, subsidies and increase in energy costs have meant that agriculture in this ecologically fragile region has become riskier and less remunerative. With increased cost of production, droughts result in large losses. The All India Kisan Sabha (AIKS), with large popular support in Shekhawati and in the canal-irrigated North Western region, has successfully mobilised peasants against anti-farmer policies of these governments. 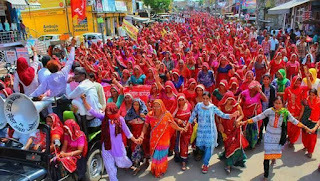 In 2004-05, Kisan Sabha organised agitations for release of canal water in Sri Ganganagar and Hanumangarh districts and for reversal of power tariff hike in Shekhawati region. The agitations were met with brutal repression by the then BJP government in which six peasants were killed, hundreds injured, and many leaders and protestors jailed. Finally, an eight day long mahapadav (mass sit-in) in Jaipur, in which about one lakh peasants participated, brought the then Vasundhara Raje Scindia government to its knees. All demands of agitating peasants were accepted by the government and the hike in electricity tariff was put on hold. Successful implementation of MGNREGA and debt waiver announced by P. Chidambaram in February 2008 helped Congress in coming back to power in elections held in December 2008. However, with the UPA-II government at the Centre and the Congress government in the State only working to further neo-liberal policy agenda, these gains dissipated quickly and Congress lost again to BJP in the 2013 elections. Agrarian distress in Shekhawati intensified greatly after BJP formed governments at the Centre and in the State. On the back of two successive years of drought, the BJP governments launched an assault on livelihoods of farmers with demonetisation, restrictions on cattle trade, terror of cow vigilante groups, increases in power tariff, stagnation of minimum support prices, and imposition of GST. In September 2016, Rajasthan Electricity Regulatory Commission announced an increase of 35 paise per unit in the price of electricity for agriculture. Demonetisation was announced when farmers were about to harvest their onion crops. Crash in prices of onion resulted in massive losses, and many farmers were forced to dump their crops. Low Minimum Support Price of wheat and rapeseed further contributed to the distress among farmers. Shekhawati and nearby areas have seen many attacks on cow traders by gau-rakshak groups because of which farmers in distress are unable to sell even their unproductive cattle. Abandoned cattle have become a menace, destroying crops in villages, because of inability of farmers to sell cattle. Early this year, Kisan Sabha started mobilising peasants against the electricity tariff hike. After a series of meetings in the villages, a large demonstration was organised in Sikar on February 2, 2017, which was attended by about 30,000 people. It was decided to organised a large sit-in in Jaipur on March 2nd. However, sensing the widespread anger against the anti-farmer decisions, on February 18th, Vasundhara Raje Government decided to reverse the decision of increasing power tariff. Although the increase of power tariff was reversed, intense economic distress continued among farmers due to a number of policy decisions of the central and the state government. AIKS prepared a charter of 12 demands which included waiver of farm loans, implementation of Swaminathan Commission report, payment of remunerative prices, removal of restrictions on cattle trade, dealing with the problem of abandoned cattle, reversal of withdrawal of funds to cooperative societies, pension for farmers, employment opportunities to the unemployed, removal of toll charges, provision of free electricity for agriculture, building canal irrigation network in Sikar, prevention of atrocities against dalits, minorities and women, and improving the public distribution system and implementation of MGNREGA. To pressurise the government, AIKS organised a kisan curfew for four hours in Sikar on July 17 and a programme of mass arrests on August 9. Campaigns were conducted across the district to mobilise peasants. Finally, a mahapadav was organised on September 1, which lasted for 13 days. Over this period, about 15,000 peasants sat on a dharna at the Sikar mandi, while lakhs of people, from various sections, were on the streets to enforce a total strike across Sikar district. In addition, protest actions were organised in 11 other districts in which thousands of people participated. A massive mobilisation of people, which included not just farmers but all sections of the working people in Sikar and 11 other districts, forced the government to talk to kisan leaders and accept their demands. Kisans of Sikar have fought many valiant struggles against oppression and against anti-people state policies. This year’s struggle in Sikar has once again shown that it is only through such mobilisations of working people that anti-people actions of the current government can be checked.